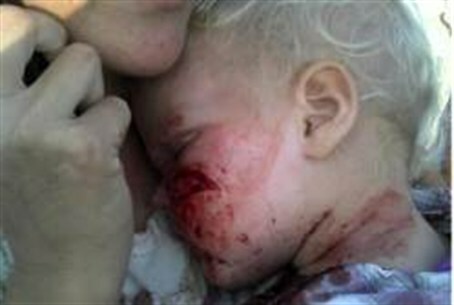 Arabs threw rocks at an Israeli car in Samaria, injuring the baby girl in the face. Arabs threw rocks Wednesday at an Israeli car between Migdalim and Tapuach Junction in Samaria. A 20 month old girl was injured in the face. The baby girl received treatment from Samaria Regional Authority medics and evacuated to a hospital. The Authority Head Gershon Mesika said: "The 'men of peace' of the Palestinian murder authority provide yet more proof, to those who still need it, as to just whom we are facing. We face low life terrorists who try to murder babies." "They hold an olive twig in their mouths and murder weapons in their hands. To these barbarian terrorists they want to give a state. The Nation of Israel is strong, the government needs to learn from it and be strengthened by its spirit – no to folding and surrendering, yes to construction and stamping out terrorism." An Israeli citizen was lightly wounded from rocks hurled by Arabs as he drove near Halhoul. Three Arabs were arrested Wednesday afternoon in confrontations with security forces near the Kalandiya checkpoint. Earlier, they threw rocks at IDF forces and burned tires. Several dozen Arabs threw rocks at Border Policemen near Har Adar, not far from Jerusalem. No one was hurt. The policemen used riot dispersal gear to scatter the rioters.